CoolMom.org and Westside Baby organized a car seat recycling event October 10, 2010. They collected about 300 car seats, far exceeding their expectations. Most of these were dismantled so that metal and plastic parts could be recycled (before disassembly, car seats have to be treated as trash). In addition, 50 of the seats were new enough that they could still be used. These seats were donated to the low income clients of Westside Baby. 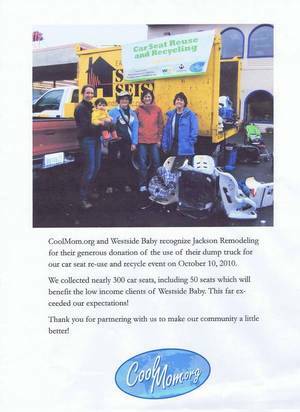 Jackson Remodeling was honored to be able to help in a small way with this great event.